I'm not an adventurous eater. And yet, when presented with a fungal spore that had been growing beneath a rotting tree some hours ago, I'm deliriously delighted! 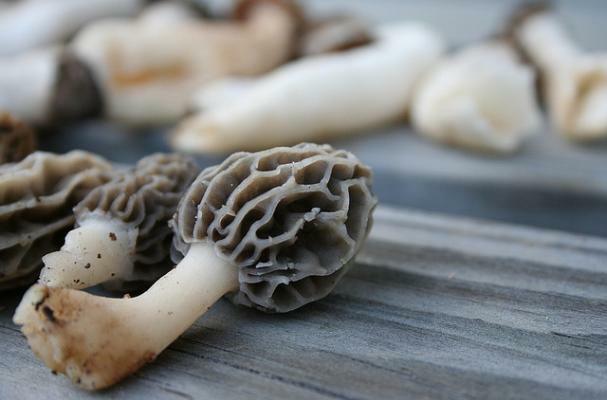 Not horribly long ago, a friend brought me fresh morel mushrooms -- quite the treat! While I never hesistate to order when I see them on the menu, somehow preparing them at home seemed like quite the daunting task! In the process, I discovered 3 marvelously munchable gluten free ways to prepare these fabulous fungi that preserves their flavor & texture and your time! Whoever said custards were only on the dessert menu was so very, happily wrong! Creamy morel mushroom custard with a rich shallot jus will make quite the impression. Creamy, salty risotto studded with chunks of earty, meaty mushrooms -- you'll just wish that your bowl was bottomless! A match made in heaven -- perfect for an intimate dinner party. Wow that is some growth for a mushroom !